There are few things at dinner that are as annoying as a wobbly table, where there are three legs touching the ground. Luckily, this is a problem that is easily fixed. It only takes a few minutes of time and this method makes it possible to fix the table for very low cost, if any. 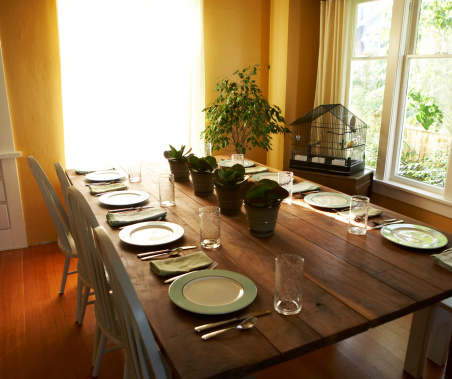 Lift the table off the ground slightly, so that the shorter table leg or legs are not touching the ground. Push up on the underside of the table, or lift the faulty corner, with your helper holding the level on top of the table. Move the table up and down until your helper tells you that the surface of the table is completely level. Continue to hold up the table once it is level, and have your helper measure the distance between the faulty leg or legs and the ground. Cut cardboard inserts the same diameter and shape as that of the leg and glue those inserts together until they fill the distance between the bad leg(s) and the floor. When done, measure with the level one more time to make sure your table is perfectly level and does not wobble.